Last weekend, I made up a larger-than-usual batch of homemade yogurt. Once the Midwestern Gentleman and I were stocked with yogurt for the week, and I gave some away to friends, I found I was out of containers and still had about 32 oz. of yogurt leftover. Perfect — time to make labneh! 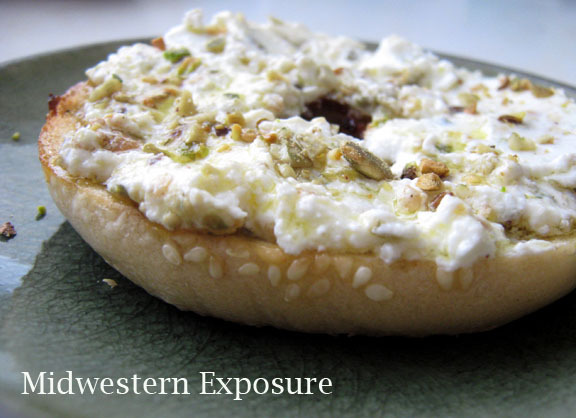 Labneh is a Middle Eastern soft cheese very similar to cream cheese. All you need to do to make it is line a colander with a few layers of cheesecloth, and fill it with plain yogurt (either homemade or store-bought will work fine). Set the colander over a large bowl and leave it in the refrigerator for about 24 hours. Ladling homemade yogurt into a cheesecloth-lined colander to make labneh. 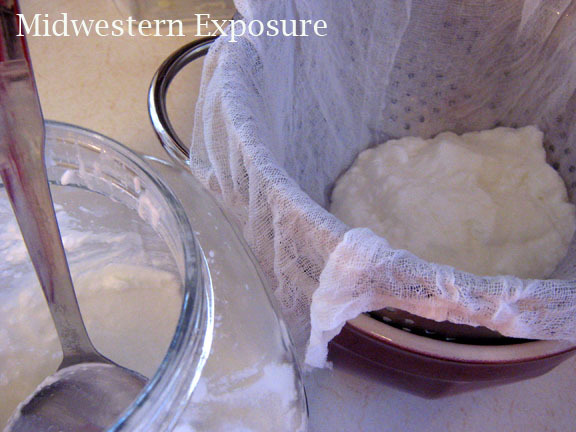 The whey will drain into the bowl, leaving the yogurt “cheese” behind in the cheesecloth. Keep in mind that, once the whey drains out, the yogurt volume will be reduced by up to half, depending on how thick or loose your yogurt was to begin with. From the 32 oz. of yogurt I started with, I ended up with just about 20 oz. of yogurt cheese. Mold the cheese into one large ball and store it, wrapped tightly, in the refrigerator. Serve as a dip or spread in a small bowl drizzled with olive oil and the spices of your choice. 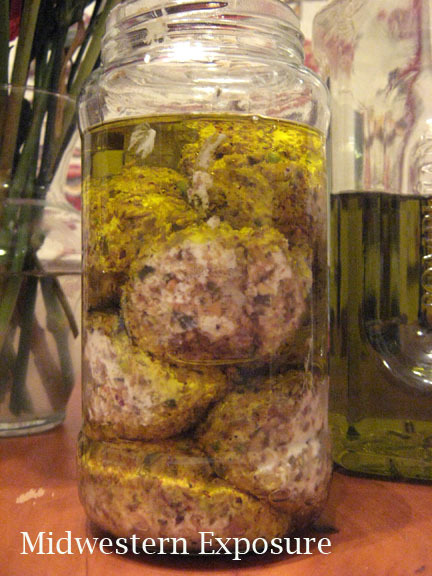 Or, you can shape the cheese into smaller balls (this is easier to do with wet hands) and roll the balls in an herb blend or crushed spices. 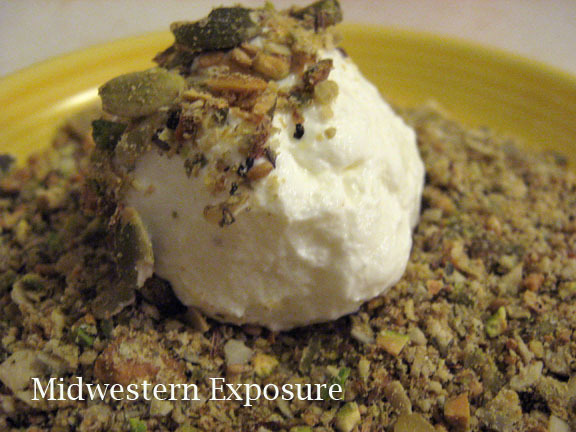 Rolling a ball of labneh in pumpkin seed & pistachio dukkah. I had recently made up a batch of this amazingly delicious recipe for pumpkin seed and pistachio dukkah, so I rolled my balls of labneh in it. Coarsely grinding the toasted nut, seed, and spice mixture in a mortar and pestle to make dukkah. After they have been molded and spiced, place the labneh balls carefully into a jar and fill the jar with enough olive oil to cover them. Store in the refrigerator for up to about 3 weeks. I like to smoosh a ball of dukkah-laced labneh on a slice of wholegrain bread as an after-work snack, or spread it on a lightly toasted bagel for breakfast. It would also make a great dip for crackers or pita chips. I spent $4 on a gallon of local Iowa milk, and $1 on 6 oz. of a local Iowa dairy’s version of Greek yogurt as my starter. The same dairy’s 6-oz. regular yogurt (what we usually buy) sells for $0.60 apiece, and a commercial jar of plain labneh costs about $7. So, I figure I saved about $12 making yogurt and labneh instead of purchasing them. The savings makes my homemade dairy products taste even better. T, if you’re not interested in making labneh, have you tried looking at Middle Eastern groceries? They sell it here in Ames, IA, at Pammel Grocery.